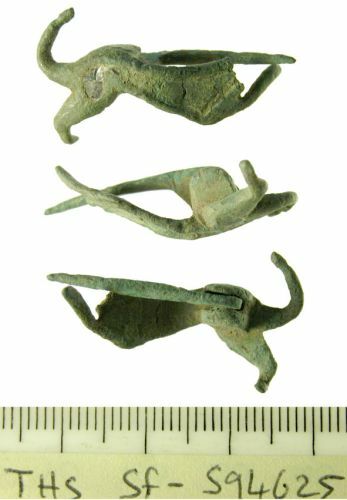 An incomplete copper-alloy zoomorphic plate brooch of Roman date. The brooch is in the form of a dog that is flat, slightly bent and missing its neck and head due to old breaks. It has a sub-triangular shaped body with narrow hind leg and thin tail that curves slightly forwards above the hind end of the animal. The front leg is thin and extends forwards to give the impression that the animal is running. On the front face is a large recessed field that covers the majority of the body and preserves traces of blue enamel. On the back face at the hind end of the dog is an integrally cast semi-circular double lug where the copper-alloy pin hinges. This is circular in section with a flattened D-shaped plate at the lug, and tapers towards a relatively sharp point. The brooch measures 29.52mm in length, 16.64mm in height, 1.32mm in thickness, and weighs 3.01g. Similar zoomorphic brooches in the form of dogs are published by Hattatt (1989: nos. 610, 1187-1188) with his no. 610 providing the closest parallel to the current example. These indicate a date in the 2nd century AD for the brooch.